I am an avid fan of George R. R. Martin's A Song of Ice and Fire fantasy epic. I gnawed on the books for well over a year, slowly making my way from the seven kingdoms to the shores of the Jade sea, devouring Martin's lavish world with steady determination. Naturally I have also watched the Game of Thrones HBO series and eagerly look forward to every new episode, even when I already know what's going to happen. The point of all this is that for the first time, I feel I have a genuine interest in how a game company handles licensed material. I love Star Wars of course, but my expectations are relatively low when it comes to Lucas-inspired game products. The novels, the immensely successful television series, and even the board game, lifted my hopes for any media tie-in at this point. You can imagine my disappointment, then, when I spotted some of the very negative reviews given to the recent Game of Thrones video game by Cyanide. This is not the first attempt at a Song of Ice and Fire game, but it is the first that actually struck as a potential success. Now I have not played the game yet, so this is not a judgement on the game itself. Rather, I want to discuss a few of my general expectations of a well-executed Game of Thrones game. Tone: The world of Westeros, in both the novels and the television series, is oppressively dark and often hopeless. Character we grow to love are killed mercilessly and right when things couldn't get any worse, they do. At one point, during the third novel, I completely despaired (If you've read the series, you will know moment). I wanted all of Westeros to burn to the ground because, as I saw it, all was lost. But after a short hiatus, I read on, pulled further into the world, and forced again to care about its outcome. Any game adaptations of the series must be saturated with despair and, nevertheless, a sense of determination, even in the face of certain death. 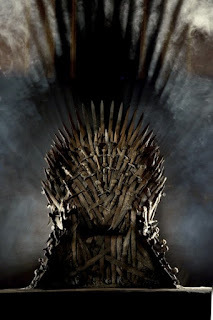 Politics: More interesting than some of the mundane tertiary characters in A Song of Ice and Fire are the political machinations and greater levels of intrigue populating Westeros, both out in the open and hidden. The series is more than the story of a few noble houses. It is the story of feuds, lies, lust, and betrayal stretching back centuries. Anyone, even a child, can change the world with just a few words or quick stab with a sword, sending political ripple throughout the seven kingdoms. Some nations lie in wait, scheming until they find the perfect moment to strike, others play than game of thrones out in the open, fighting their political battles with sharp tongues and a inked quill. No game can do Martin's world justice if sword and shield is more emphasized than diplomacy and deceit. Themes: Similar to the above, A Song of Ice and Fire is rife with grand themes about loyalty, honor, religion, and heroism. This is a world in which the power of the Gods is palpable, but still distant; in which prayer matters because the night really is dark and full of terrors. Heroes are seldom pure and purity is never enough to keep your head. The series stands out in the fantasy genre because it tackles some very adult themes because and in spite of its unrepentant abandonment of many genre norms. Any game that lands its vessel upon the shores of Westeros must be prepared to address themes too few games ever approach. Looking back at these requests, I can see my expectations are a little high. In fact, they are probably impossible to meet. But I thought the same thing at the news the books would be made into a television series. Our my dreams too lofty? Is this how you approach games based on titles you love from other mediums? My only hope for games based on properties from other mediums is that they be made by developers who truly care about the source material, above all else, even game design. I think I would rather see an effort that shows conviction than a quick attempt at a cash-in.